A Boy Scout learns how to survive in the wilderness. Trained correctly, he can sense danger and steer himself and others clear. But when faulty ideologies reconfigure the training ground, a young man’s moral sense is compromised. Adults who should know better can boast, “Look at what we’ve done! We broke new trail for young men!” But this trail most definitely leads off the edge of a cliff. Why would anyone want to tamper with moral behavior and remove boundaries put in place for the human good? Jesus said, “Whoever causes one of these little ones who believe in me to sin, it would be better for him if a great millstone were hung around his neck and he were thrown into the sea” (Mark 9:42). When a scout questions his male nature, how will his troop leader respond? Will he help the young man practice self-control? 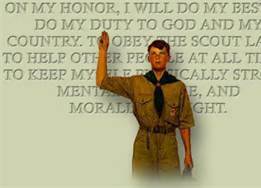 Will he remind the scout of his pledge to “do my duty to God . . .”? And, if so, what god will he be pledging to? Here he faces the most dangerous cliff of all. Defined as a “sexual being,” a boy may be tempted to give himself freedoms that God does not; to trust his own reason and desires; to, in fact, worship and serve self rather than God (Romans 1:24-25). In time, sexual identity can influence everything… even the way a boy sees God. When society redefines morality, identity and even the character of a Boy Scout, then it redefines God. It will not just be young men who are in danger. It will be all the others who fall into idolatry with them. I’d like to believe that many young men, in doing their “duty to God,” have been encouraged to see themselves as God does. God does not call a boy “gay” or “straight.” He calls him “holy.” Even in the midst of conflicting desires, God equips a boy to rise above self to Him and through Him resist dangerous attitudes and behaviors. God says, you “will be a vessel for honorable use, set apart as holy, useful to the master of the house, ready for every good work” (2 Tim. 2:21). Identified this way, a young man can blaze a trail for himself and others away from danger. What god does a boy pledge to — the Creator who made woman a “good fit” for man in the faithfulness of marriage, or the god who declares sexuality not a moral issue but a civil rights issue? It matters. It matters a lot because a god in our own image is no god at all. Such a god cannot help any boy navigate the wilderness of life. Foolishness is tampering with marriage. Now it threatens another institution. God did not establish the Boy Scouts, to be sure, but He did establish the boundaries of morality and character. He does not give us license to do as we please. He does not make square pegs to fit in round holes. He does not delight in a boy’s frustration and misery. But He does offer wisdom and strength to change… or practice self-restraint. Only the God of all creation enters the chaos of this world to bring order and goodness to life. New trail for scouting may have been broken, but it leads off the cliff. Rather than sinning against God and all that is holy, the most courageous thing a boy might do is to turn away to a trail less traveled. Separate from the pack. Together with dad, grandpa, and men of faith, set safer course. P.S. Looking for a collection of outdoor adventures and character building supplies? I highly recommend Vision Forum.